Being asked to work on the Two Hoots team by Suzanne Carnell is a huge honour. Suzanne always surrounds herself with creative and thoughtful people who can create magic out of thin air - from her designers, her editorial team to her authors and illustrators there is an aura of creative genius around her. The Two Hoots books speak to both adults and children on so many levels and they are things of beauty - a marketeer's dream. the first thing i do when i get my hands on a finished copy of a book is to stroke it - sounds odd - but i defy you not to stroke the books on this list - they are beautiful objects and you can bet your bottom dollar that every decision from paper weight, to the size of the book and of course the finishes will have been carefully chosen to make it the very best book it can be. so - what have i been up to to help launch this wonderful list of strokable books? we'll we've created lovely owl presenters who've flown off and told press, buyers and industry people what we are about. we've made trailers to whet appetites for our new books and help bring them even further to life. 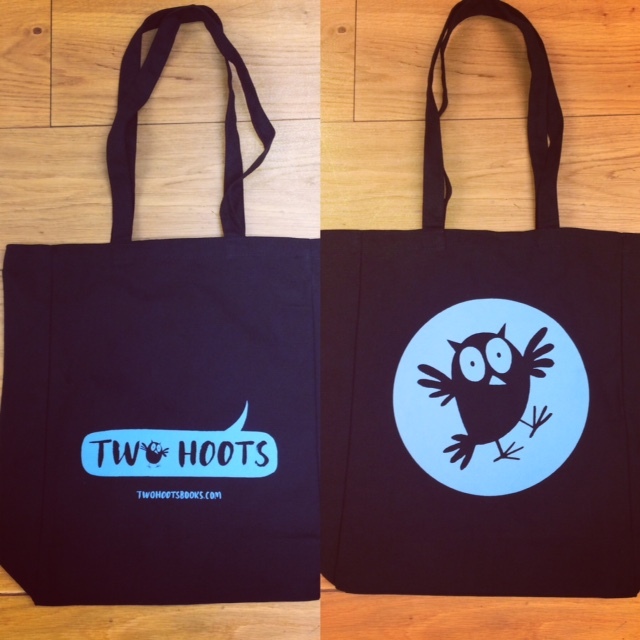 we've made bespoke printed owl bags that some lucky people will get to tote around with them (look out for competitions!). we've been working will the authors and illustrators on campaigns to bring their books to the people that are going to treasure them and then, if that's not enough - we've been seeking out and finding the voice of our owl logo... listen out for him!